Secondary Inscription: Inscribed on the back of the old mount, in graphite, "[...]R. van Orley"
Pietro da Cortona made this drawing as a finished study for an engraving in De florum cultura, the first treatise on horticulture. Pen in hand, Jupiter has signed the edict to exhort all gardeners to cultivate flowers, marking the passing of the Age of Iron to the Age of Flowers. On the right, Cybele, the Phrygian earth mother, enters with her sacred animal, the lion. The council of gods has agreed that she and Flora, Roman goddess of flowers, shall grow flowers on earth. 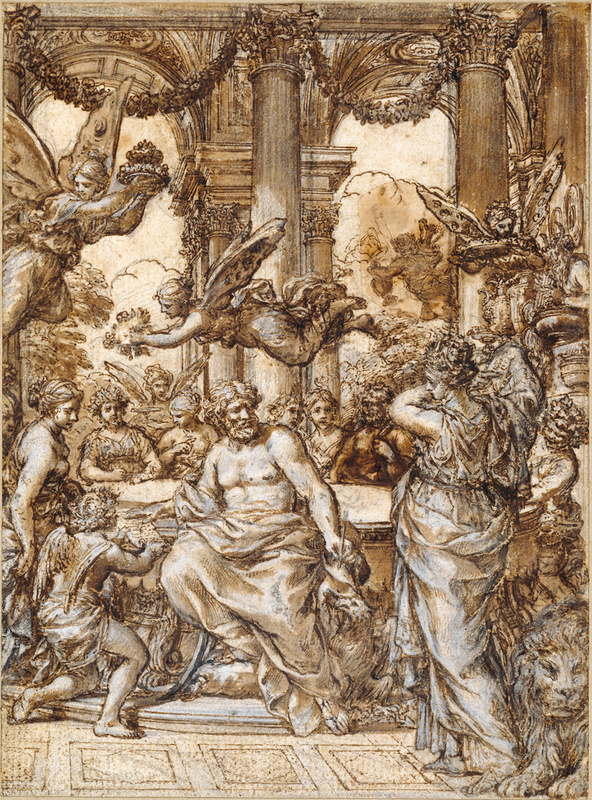 Pietro da Cortona drew here with the precision and minute detail of a miniaturist, a marked contrast to his usually more rugged and spontaneous approach. He applied brown washes with the point of the brush, used the pen for hatching and cross-hatching, and finally added delicate white highlights. Surface abrasions occurred when the engraver drew a sharp stylus over the outlines to impress the design into the metal printing plate. To replace earlier attempts, he drew Hercules' torso and one of the winged Nike figures on smaller, cut-out pieces of paper overlaying the original sheet.